So, apparently, I really wanted to get a lot done today…however, I chose to start at 5:00…poor choice # 1. Although I followed the directions to a T, I somehow ended up with 1 1/2 times the servings it was supposed to make. Oh, well- more for me. So, now the soup will be done around midnight…you know, when most people want lasagna soup, right? Needless to say, that soup better taste good tomorrow after my long night of cooking. Pictures to follow once all is cooked! 1. My job- Although it took me away from J, I am glad that I have a full-time, well-paying job in this slow job market. Here’s hoping J can find a job soon, too! I feel so fortunate to have such wonderful people to work with, as well as such a wonderful school environment. Although stressful at times, this job is so rewarding! 2. My fiancé- J is soon to move back to our humble apartment. I can’t wait to have him back! Although I will decorate the apartment without him, I am looking forward to celebrating Christmas and New Year’s with him this year!! 3. My two families- It is definitely nice to spend time with my family and J’s family this Thanksgiving! Also, thankful that both Thanksgiving celebrations were on separate days. Finally, thankful that we get to watch the big game together this year- Go Blue! So, a short and sweet note. Spent the weekend with J, celebrating our 7th anniversary. We’re in our early twenties, so 7 years is quite some time. I’ve heard from people that we are too young to marry-but when you are together for seven years, you go through a lot together. We are even stronger and, in my personal opinion, ready for marriage because of what we have been through. In seven years, we have gone through breaking of friendships, J’s mom’s cancer, high school, college, my moving away and getting a job, a long-distance relationship for the last 9 months, a hard summer with little salary, etc. But, I believe it is important to note that we have also gone through proms and homecomings, weddings of friends and family, vacations at Chautauqua, a wonderful summer in the city, wedding planning, and just plain loving each other every day. An hour later, I was in my car, driving to his college campus to visit him. It also happened to be his fraternity’s “date party” (basically, a themed party). I pulled into town around 12, had lunch with my parents, and spent the day preparing my costume for the party. The theme ended up being “Halloween,” which meant I needed a full costume, and fast. A fairy I became after purchasing a set of wings and a wand. J was a panda. Clearly, fairy+panda=match made in heaven. 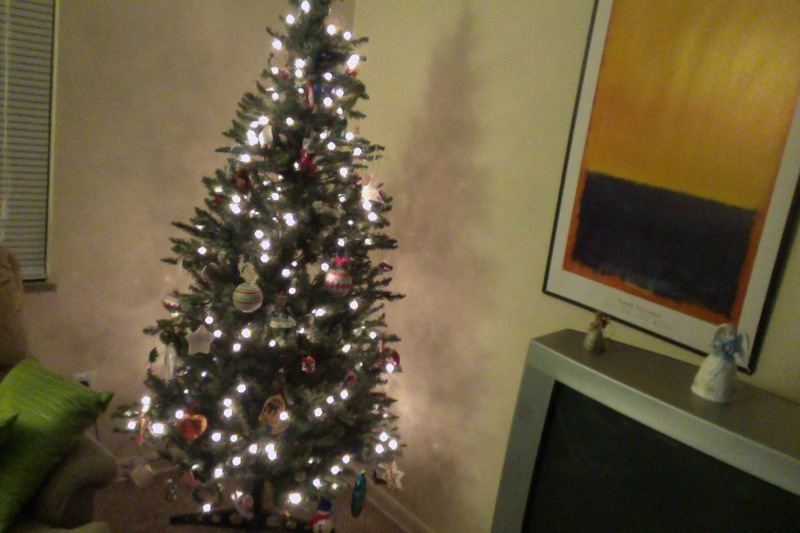 Also, bought my very first Christmas tree yesterday! So exciting. No worries- not putting it up yet. I was at my local hardware store, knowing that I needed a tree. I found an excellent 6ft tree that was on sale 50% off at $49.99. SOLD! I also got three new ornaments for a total of $5 (two argyle and one stripe…perfect for our tree). I am currently in the process of making minestrone for the first time. We are three hours into the six hour cook time. It already smells heavenly in here. I’m serving mine with parmesan cheese, and possibly biscuits. Also in the near future? Zucchini-banana bread…I have an extra zucchini and some overly ripe bananas. Two posts in one week? Weird. So, even though I have had a lot less time to myself this week, I somehow find myself blogging twice! In one week! This might be a record. Anyway, I like how dinner is turning out, so I though it would be good to share! I combined a bunch of recipes to make my own tonight- yummy! 1. Put soy sauce, ginger, garlic, sugar and corn starch in ziploc bag; shake. 2. Put pork chops in bag; seal; shake. 3. Marinade for 30 mins.-1 hour. 4. Sear pork chops on both sides. While this is all happening…rice-y stuff! 1. In a saucepan, combine everything EXCEPT rice. 3. Once boiled (and spinach wilted), add brown rice; simmer. 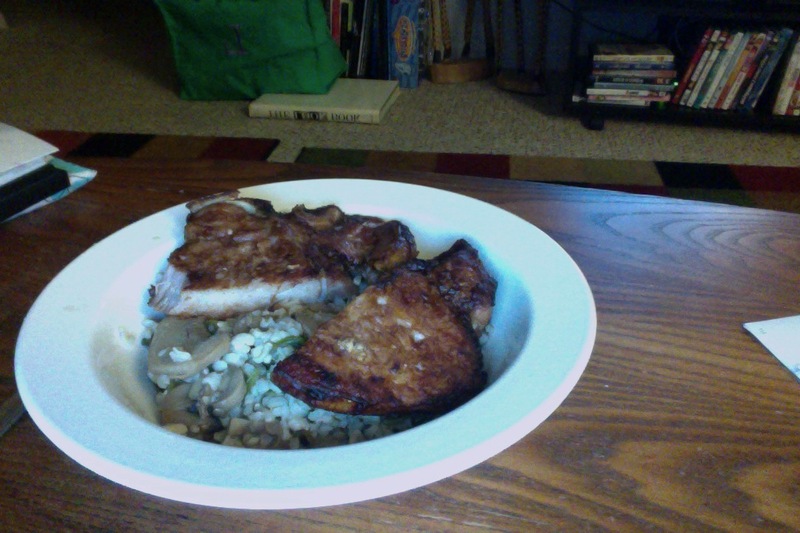 To serve: I used my pasta bowls, putting down a 1 cup of rice-y mixture and 1 pork chop on top. Yum!! In other news, cannot wait to see Spring Awakening tomorrow. Heading to a local show with my sorority sister and her biological sister. Should be a blast!! Also- exactly 5 weeks to J comes home!!! We’re getting close!